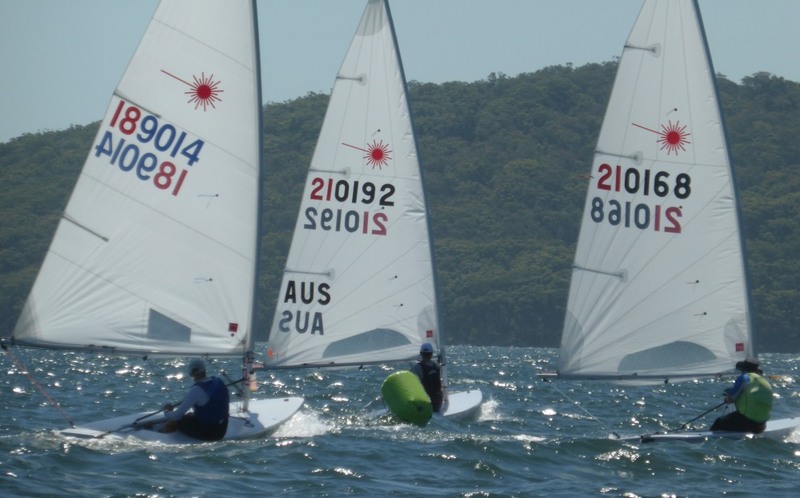 Brett has just won the Aussie Laser Masters, again, beating 38 competitors (and discarding a 1st). While his speed downwind was good, he feels that his speed upwind was not. Here's his report. I used a brand new MarkII sail at the AUS Master Nationals. About half the fleet used the old cut sail, including some very competitive sailors. I’ve seen the sail in use many times line up against the old cut sail but this was the first time I’ve had the opportunity of using it myself. Upon first impression, as expected, was the sail has very nice shape and produced more power (but more weather helm) than the old sail. This suited the flatter water and light breezes very nicely. The deeper head and firm leech really provides great feedback and feel. This was very nice upwind, on reaches and downwind. In fact, downwind is where sailors that struggle to precisely set-up correct vang will mostly benefit. It is simply easier to get right downwind and on reaches. This is all very positive so far and is an easy decision in such conditions. It is when the breeze picks up along with the chop that things can begin to change around. With most of our races sailed in choppy 8 – 15 knots, I found the sail too ‘sticky’ upwind and couldn’t release the power easily enough. This is usually done with either downhaul and/or vang, but this sail suffered when I pulled any of these systems on. Also, simply getting the sheet tension correct upwind took so much attention away from my sailing that it was difficult to have anything left over for tactics or technique. Any upwind speed advantage I used to have was no longer there with the new sail. At best, I could only stay with the top guys upwind and made all my gains downwind mostly due to technique and not the sail. Brett in the middle - downwind speed was good. The perplexing thing for me was that some of those ahead of me were using the new cut sail and seemed to make it work upwind. So whilst I was coming first across the line, I was quite disappointed with my performance upwind. After 3 days of racing I had made up my mind to definitely not use the new sail for Worlds, preferring instead to rely on the predictable performance of the old sail. On the last day of racing, I had my only upwind where I felt the speed was superior. This, in similar conditions with similar set-up. So why? It seems the sail, with its firmer leeches and better quality cloth needs more ‘break-in’ time than the old cut sail. This was the general agreement amongst those that have used the sail far more than I have. So, what sail for the Worlds? Answer 1: Old sail if you can’t get enough training time with the new sail. Answer 2: Old sail if you are already comfortable with your speed/height/versatility upwind and wave catching downwind. Answer 3. New sail if you think wind will be lighter, water flatter and you have good sheet tension skills. Answer 4. New sail if you can get to use it in training for more than 1 week. Answer 5. New sail if you expect good winds (14kts+) and have good upwind technical skills and fitness. Speaking of trimming and set up, what are the differences you found betwen the two sails in terms of outhaul, vang, downhaul? You have to go quite easy on the downhaul as it doesn't have the same effect as the old cut sail. Excessive downhaul just distorted the sail and didn't relax the leech like the old sail. I found the vang just washed off too much power in the medium breezes but suspect it would be more tolerant in winds over 15knots. For sure the new sail needs firmer/flatter outhaul. The already hooky sail didn't like a deep foot. So, slight variations compared to the old cut sail but nothing radically different. I am still wondering about the fold (top to bottom )near the luff downwind in light air (~5 mph). Should I try to get rid of it by putting on a lot of vang, or just let it be...? Just make sure you have your Cunningham set-up to be VERY loose for downwind. Even if you have to go forwards and push the sail up the mast. Don't use vang to remove it otherwise you are over-vanged downwind and will suffer. Besides the fold near the luff downwind in very light air, my experience with the new sail is that the leech remains very tight and does not open nor flutter, but more important the boat speed is evidently lower compared to my friend sailing the old one! Above 6-7 knots the problems disappear because the cloth eventually takes the right shape. Brett, have you tried it with this very light wind?